DENVER (AP) -Peter Forsberg isn't sure he feels like his old self just yet. He sure looked it Wednesday night. After being moved up to the second line, Forsberg had three assists in the Colorado Avalanche's 6-3 victory over the Vancouver Canucks. "I don't know if I'm back yet. Those weren't the prettiest points, but I'll take them anyway," Forsberg said. Forsberg doubled his point total since rejoining the Avalanche on March 4, nine days after signing with a $1 million deal for the remainder of the season. He has yet to score a goal in his second go-round with the Avalanche, a team he won two Stanley Cup championships with before their split following the league's lockout in 2004-05. Forsberg, who sat out the first four months of the season because of a right foot injury and is coming off a strained groin, said he's finally skating better. "I think so. I'm going to keep working. It's hard to not put pressure on yourself," he said. "Of course, I want to produce and score a couple of goals. At least I was playing a little better today than I was in the past couple of games." Coach Joel Quenneville noticed early on and late in the first period he replaced Ryan Smyth on the second line with Forsberg. The move worked wonders: the trio of Milan Hejduk (two goals, one assist), Paul Stastny (one goal, two assists) and Forsberg combined for nine points after that. "People are playing a lot of attention to Milan and Paul because they're great players. They worked hard creating for each other," said Forsberg, who played on a line with Hejduk in 2002-03, when Hejduk had his only 50-goal season and Forsberg won the MVP. "It's great to be playing with Milan; he's such a natural goal scorer." Stastny said the addition of Forsberg opened things up for everyone on the line. "Any time you have a top-caliber player they've got to respect what he does," Stastny said. "He can score, too. He hasn't scored yet, but he's a pass-first player these days. Hedgie's the natural goal scorer on that line, but we can chip in here and there. You have to watch all of us and it makes it easier to move around." The Avalanche broke a seventh-place tie with the Canucks in the tight Western Conference playoff race with their second straight win on home ice following a four-game skid. The Canucks lost their third straight. Daniel Sedin and Taylor Pyatt scored to give Vancouver a 2-1 lead in the first period. Colorado turned that deficit into a 5-2 lead by 11:31 of the second period, after which Vancouver coach Alain Vigneault pulled goaltender Robert Luongo and replaced him with Curtis Sanford. Stastny, Cody McLeod, Hejduk and Ben Guite scored goals in a 6 1/2-minute span as the Avs matched a season-high for goals in a period. Forsberg had two of the assists in the four-goal outburst. 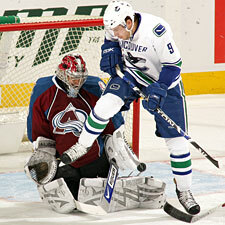 "He adds another dimension to that team," Canucks forward Markus Naslund said. "Another dimension to a team that is already good at scoring." Stastny's 23rd goal tied it at 4:54 and followed a great pass to Hejduk from Forsberg. Hejduk's shot hit the left post and Stastny sent the rebound shot past Luongo. A minute later, McLeod's fourth goal of the season, off a long pass from John-Michael Liles, put the Avs in front 3-2, and Hejduk made it 4-2 with his 24th goal on assists from Stastny and Forsberg. A minute after that, Guiete's 11th goal forced the Canucks to switch goalies. "Every period is huge when you're playing a divisional game," Forsberg said. "It's good for the confidence when you get a couple of goals and get to score a couple of goals on Luongo. When they scored to make it 5-3 it was a tough goal to let up at the end of the second." Jose Theodore, who had allowed just seven goals in his first four starts against Vancouver, allowed his third of the night with 9.4 seconds left in the second period when Sami Salo scored from the right point to pull the Canucks to 5-3. Hejduk made it 6-3 with a wrist shot 23 seconds into the third period. Theodore improved to 4-0-1 against Vancouver this season with a 2.00 goals-against average. Notes: Avs D Jordan Leopold scored his fifth goal of the season and second in 48 hours to give Colorado a 1-0 lead in the first period. He later suffered a minor hip injury. 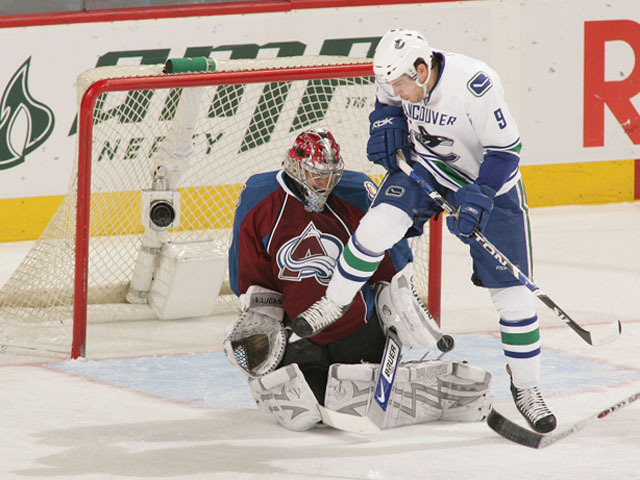 ... Hejduk scored his 31st and 32nd career goals against Vancouver. ... Avs D Adam Foote (hip) missed his third straight game.